From TARDIS version 3.6 and higher, the TARDIS Control Menu is the main way to access the TARDIS’s functions. Previously the TARDIS had multiple signs scattered throughout the console to access its various GUIs. 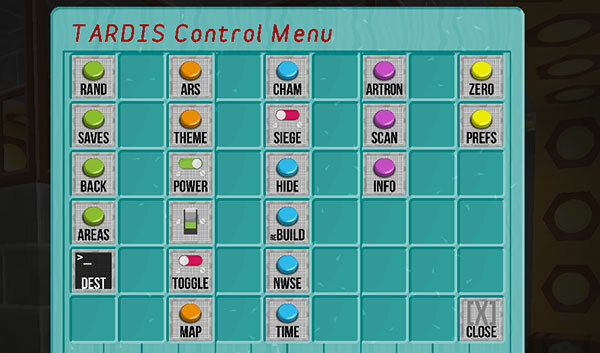 The TARDIS Control Menu brings them all together in one place. The TARDIS Control Menu sign displays information about the TARDIS’s location and Artron Energy levels. Click on the sign and its position will be added to the TARDIS database. To use the TARDIS Control Menu, right-click on the Control Menu sign. Random Location Sets a random destination based on the position of the console world, x, z and multiplier repeaters. Saved Locations Opens the TARDIS Saves GUI. Fast Return Sets the destination to the last location the TARDIS travelled to. TARDIS Areas Opens the TARDIS Areas GUI. Destination Terminal Opens the TARDIS Areas GUI. Architectural Reconfiguration System Opens the Architectural Reconfiguration GUI. Desktop Theme Opens the Desktop Theme GUI. Power Toggles the TARDIS power on and off. Light Switch Toggles the TARDIS lamps on and off. Toggle blocks behind door Removes or places the wool behind the TARDIS door. TARDIS Map Opens the TARDIS Map GUI. Chameleon Circuit Opens the Chameleon Circuit GUI. Siege Mode Toggles Siege Mode on and off. Hide Hides the TARDIS exterior. Rebuild Rebuilds the TARDIS exterior. Direction Changes the direction the TARDIS exterior faces. Temporal Locator Opens the Temporal Locator GUI. 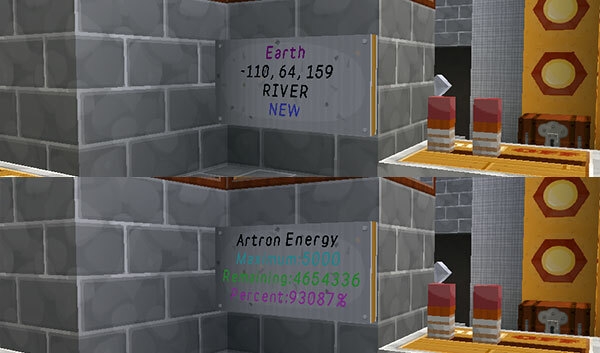 Artron Energy Levels Displays the current TARDIS Artron Energy levels. Scanner Performs a scan of the TARDIS current (or next if set) destination. TARDIS Information System Opens the TARDIS Information System chat interface. Zero Room transmat Transmats the player into the Zero Room. Player Preferences Opens the Player Prefs Menu GUI. Close Close the TARDIS Control Menu GUI.